Saturday Night Genealogy Fun - How Genealogy Literate Are You? 1) Heather Wilkinson Rojo posted a "fun" quiz yesterday on her "Nutfield Genealogy" blog titled "How Genealogy Literate Are You?" Rather than post it again here and violate someone's copyright, please go read it on her blog. 2) Answer the questions and assign the count the points as noted. 3) Please post your totals, and any comments, on this blog post as a comment, and also on Heather's post. Some of the items I could not recall experiencing, so I didn't count them. * New Women’s Records on Fold3! * Special AncestryDNA Flash Sale – Canada and UK Save up to 25%! * HUGE SALE on Genealogy Cheat Sheets at Family Tree Magazine! Did you miss the last Genealogy News Bytes - 20 March 2018? Search over 1,500 records of monumental inscriptions recorded in Ralph Bigland's 'Historical, Monumental and Genealogical Collections Relative to the County of Gloucester'. Discover biographical details relating to your ancestor as well as parish histories that include annual counts of births, marriages, and burials. The collection consists of PDF images of Bigland's original publication that have been provided by the Bristol & Gloucester Archaeological Society. Each result consists of a PDF image. From these abstracts, you may discover your ancestor's full name, residence, marital status, relatives' names, and will date. Each record includes a transcript that lists the offender's name, the location of their offence, the date of the offence and the volume and page number of the original document. Further information about the individuals listed can be found using our collection of historic British newspapers. The index is comprised of individual transcripts that list a recipient's name, birth year, death year (if applicable), the type of award they received and the date they received it. Transcripts can also include a biography which will often include the recipient's rank or position/occupation and any additional remarks, such as where they were dubbed. Search two Catholic newspapers containing over 50,000 records: the Catholic Standard, later renamed The Catholic Standard & Times, 1866 to 1951, and The Universe: The Catholic Herald and Visitor, 1833-1867. The Diocesan newspaper can reveal a wealth of information including family notices, religious news and events, notable sermons and biographical coverage of religious leaders. James Stone (1702-1783) is #298 on my Ahnentafel List, my 6th great-grandfather, who married #299 Mary Farwell (1709-1804) in 1726 in Groton, Massachusetts. * their daughter #149 Abigail Stone (1737-about 1800) married #148 Ephraim Sawtell (1735-1800) in 1757. 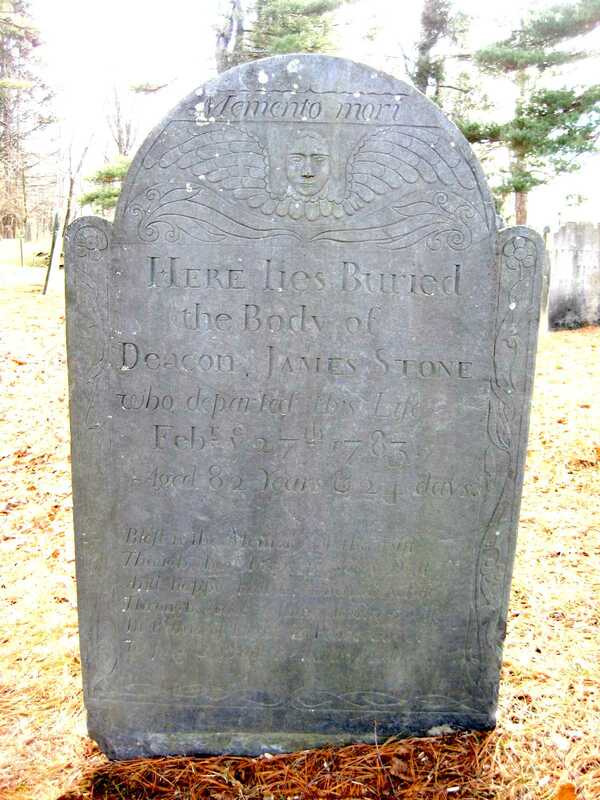 James Stone was born 23 January 1701/2 in Groton, Massachusetts[1-2,8], the second and last child of John and Sarah (Nutting) Stone of Groton. On 28 January 1726, James Stone married Mary Farwell in Groton. 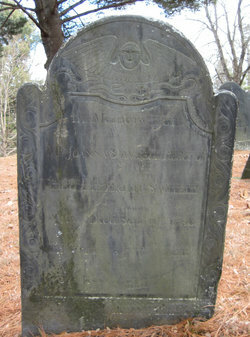 Mary was the daughter of Joseph and Hannah (Colburn) Farwell of Groton. James and Mary (Farwell) Stone had ten children, all recorded in Groton town records between 1727 and 1750. Aged 82 years and 24 days. To sing & Praise Redeeming Love. In the Name of God Amen I James Stone of Groton in the County of middlesex & State of the Massachusetts Bay yeoman, being now of perfectly sound Disposing mind and memory but considering the Uncertainty and brevity of humane life, do make and ordain this my last Will &Testament in manner following viz. My Will is that my just Debts and funeral Charges be well and truly paid by my Ececutors hereafter named. I Give and bequeath to my beloved wife Mary Stone the Improvement of all the Estate, real and personal which I Shall die seized and possessed off during her Life, eccept my Wearing apparrel which I give my Sons James, Jonathan, Joel, Salmon and Levi to be equally divided amongst them. Item. I give my son James Stone his heirs &c the Sum of Three pounds lawfull mony, to be paid by ^my^ Executor hereafter named, within one year after my decease, which Sum with what I have already given him, is his full share out of my Estate. Item. I give to my Son Jonathan Stone Three pounds six shillings and Eight pence like mony to be paid as afores^d to him or his Heirs,which sum with what he hath already received is his full share out of my Estate. Item. I give to my son Joel Stone Three pounds six shillings & Eight pence like mony to be paid to him or his heirs in manner as aforesaid,which sum with what he hath already rec^d is his full portion out of my Estate. Item. I give to my Son Salmon Stone Six pounds Thirteen shillings and four pence like mony, to be paid in like manner to him or his Heirs which Sum with what I have heretofore given him is his full share out of my Estate. Item. I give my Daughter Abigail Sawtell Six pounds like mony to be paid to her or her heirs in like manner, which sum with what she hath already received, is her full share out of my Estate. Item. I give to my Daughter Sarah Carlton Thirteen pounds Six shillings &eight pence like mony to be paid to her or her heirs in like manner as afores^d which Sum with what she hath already received is her full share out of my Estate. Item. I give my Daughter Hannah Page Seven pounds Six shillings &Eight pence like mony, to be paid to her or her heirs in like manner as afores^d which sum with what she hath already received is her full share out of my Estate. I give and Bequeath to my Son Levi Stone his heirs &c whom I constitute and appoint Sole Executor to this my last Will and Testament hereby Disannulling all other Wills by me heretofore made. In Witness whereof I the said James Stone have hereunto set my Hand and Seal this 21^st day of December Annoq. Domini 1778. The will was proved in Middlesex County Probate Court on 15 April 1783[4-5]. The probate packet includes a notice, an affidavit, a letter testamentary, a bond, and an appointment of the executor. However, no inventory, account or distribution is included. 1. Massachusetts, Town and Vital Records, 1620-1988, digital images, Ancestry.com (http://www.ancestry.com), Groton, "Births, Marriages and Deaths," image 432 of 990, James Stone birth entry, 1701/2. 2. Vital Records of Groton, Massachusetts to the End of the Year 1849 (Salem, Mass. : The Essex Institute, 1926-1927), Two volumes, Births, page 232, James Stone, 1701. 3. Vital Records of Groton, Massachusetts to the End of the Year 1849, Volume 2, Marriages, page 166, James Stone and Mary Farwell entry, 1726. 4. 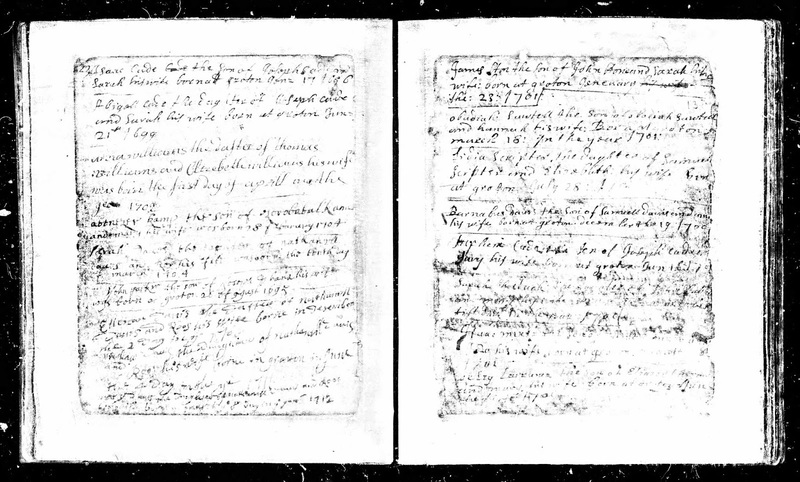 "Middlesex County, MA: Probate Papers, 1648-1871," digital image, American Ancestors (http://www.AmericanAncestors.org : accessed, 27 November 2016), Case 21,617, 8 images, will of James Stone, 1778, proved 1783. 5. "Probate Records 1648-1924 (Middlesex County, Massachusetts)," 886 FHL US/CAN Microfilms, Probate Packet 21,617, James Stone of Groton, accessed on FHL US/CAN Microfilm 0,421,530. 6. Vital Records of Groton, Massachusetts to the End of the Year 1849, Deaths, page 271, Deacon James Stone entry, 1783. 7. Samuel A. Green, M.D., Epitaphs from the Old Burying Ground in Groton, Massachusetts (Boston, Mass. : Little, Brown, & Company, 1878), page 90, Deacon James Stone epitaph. 8. Jim Tipton, indexed database, Find A Grave (http://www.findagrave.com), Old Burying Ground, Groton, Mass., Deacon James Stone memorial #112275864. COLUSA (Colusa Co.), Jan. 26 -- The will of George W. Seaver of Williams was admitted to probate here yesterday, with the bulk of his $70,000 estate going to his brothers and sister-in-law. "Seaver's will provides that his ranch west of Williams shall go to his brother, Charles F. Seaver, the Seaver home ranch of 530 acres on the Colusa-Princeton Highway to Emma Seaver, wife of Charles F. Seaver; his livestock to L.W. Seaver, and real property in Chico to another brother, John Seaver. "To his friends, Gus Miller and Jack Storey, the decedent left each an automobile." "Will is Admitted in $70,000 Estate," Sacramento [Calif.] Bee, 26 January 1943, page 6, column 4, George W. Seaver estate article; GenealogyBank (http://www.genealogybank.com : accessed 22 March 2018), Newspaper Archives. The article provides the names of George W. Seaver's brothers - Charles F. Seaver, L.W. Seaver and John Seaver, and Charles F. Seaver's wife, Emma Seaver. I had George W. Seaver in my RootsMagic family tree database. George William Seaver (1866-1942), Charles Franklin Seaver (1868-1954), and John Henry Seaver (1863-1949) were the sons of Charles Seaver (1826-1887) and Annie Timoney (1834-1903) of Colusa County, California. L.W. Seaver is probably Lloyd Wall Seaver (18961958), son of Charles Franklin Seaver and Emma (Middlecamp) Seaver (1870-1958). George William Seaver was married to Mattie Anna (Groves) Mears (1873-????) in 1921, and resided in Williams, Colusa County, California. Apparently, George had no children. His wife's death date is unknown. I am a 4th cousin 3 times removed to George William Seaver (1866-1942). He was a first cousin to George Washington Seaver (1847-1918), the subject of my George W. Seaver series. Their grandparents were Robert and Hepsibah (Gilson) Seaver of Brookline, New Hampshire. 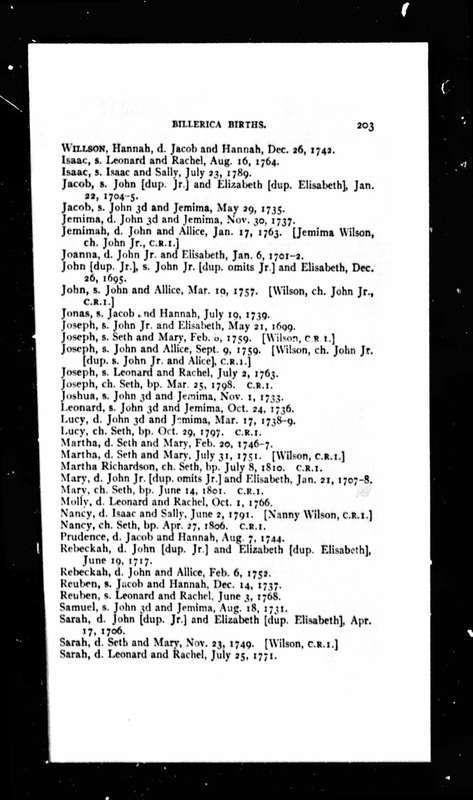 Massachusetts, Town and Vital Records, 1620-1988, digital images, Ancestry.com (http://www.ancestry.com), Groton, "Births, Marriages and Deaths," image 432 of 990), James Stone birth entry, 1702. James Stone (1702-1783) was the 2nd of two children of John and Sarah (Nutting) Stone, born in Groton, Massachusetts. He married Mary Farwell (1709-1804) in 1726 in Groton, and they had ten children between 1727 and 1750, all born in Groton. Mary was the daughter of Joseph Farwell (1670-1740) and Hannah Colburn (1673-1741) of Groton, Massachusetts. James and Mary (Farwell) Stone are my 6th great-grandparents. 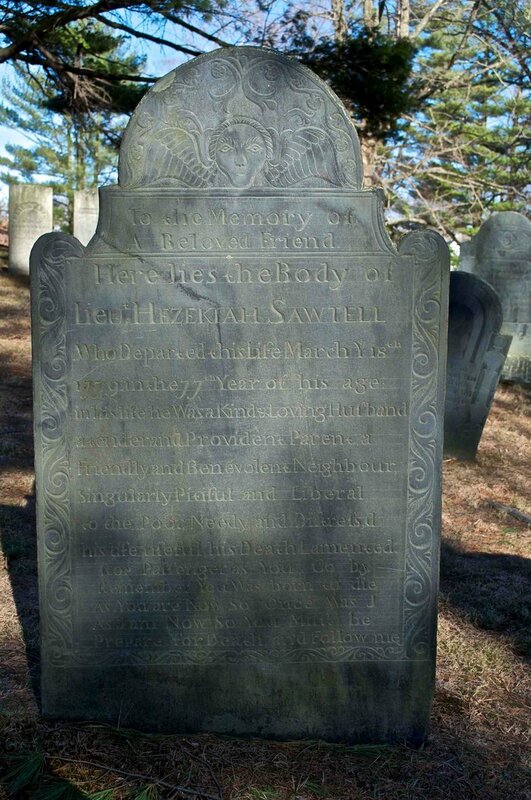 I descend through their daughter Abigail Stone (1737-1800) who married Ephraim Sawtell (1735-1800) in 1757 in Groton. Dear Randy: Why Do You Write About Your Personal Genealogy Research? While at RootsTech waiting in a line, someone recognized me and asked this question. I know I've answered this question before, but I think my answers may have changed. 1) It's "cousin bait" - someone (a cousin) may use a search engine to see if anyone knows something about their ancestor. I may have written about their ancestor. They may have information about an ancestor or relative that I don't have. ** For Amanuensis Monday, I transcribe a record I've found for an ancestor. I then add the Event that the record supports, a source citation, a media item, and an Event Note with the transcribed text to my RootsMagic database. I collect the Amanuensis Monday posts on my Amanuensis Monday Posts page, thinking that they might help another researcher. I now have 420 Amanuensis Monday posts, many of them transcriptions of probate and land records that no other researcher has transcribed. ** For Tombstone Tuesday, I post a photograph of a gravestone that I've taken (or been given permission to post), and tell something about the life of that person. I don't do these very often any more because I ran out of ancestral gravestone photographs. There are only 56 Tombstone Tuesday posts. 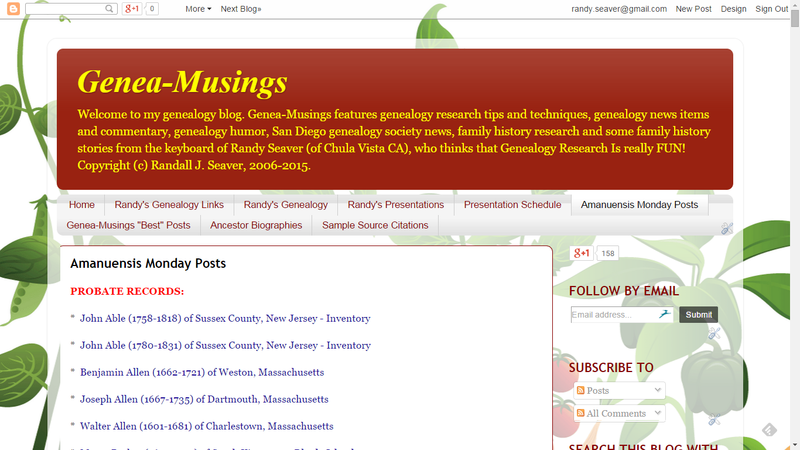 ** For Tuesday's Tip, I try to provide a tip about online genealogy resources that might help another researcher. I kind of ran out of good ideas several years ago. There are 174 posts about Tuesday's Tip. ** For Wordless Wednesday, I post a family photograph from my own family, and my parents family, and my cousins family, and describe the persons, the setting, the subject. I may add my own memory about the people, the setting or the photograph. I add the photograph to my digital photo file folders for the families in the photograph. If my family members want to see my family photos, I have over 500 of them. ** For Treasure Chest Thursday, I post a digital image of a record of interest, then transcribe or extract it, and analyze it. I then add the Event that the record supports, a source citation, a media item and an Event Note to my RootsMagic database. I have expanded this to Treasure Chest Tuesday where I'm posting a digital image of a record of interest from my wife's family. There are 496 posts in this category, which includes Tuesday and Thursday posts. ** For 52 Ancestors in 52 Weeks on Friday, I write a biography, in a narrative report form, of an ancestor, consisting of the events of the ancestor's life, the notes about the ancestor in a life sketch format, and the source citations that support the facts and notes provided. Doing this in a logical sequence (I chose to do it by Ahnentafel number starting with #8, my paternal great-grandfather) helps me focus each week on a specific person, to search for more records for the person, add notes, media and source citations as required to the person, and to make it a more complete and intelligible report. I am now through the 5th great-grandparents and am working on the 6th great-grandparents. Since starting this in 2014, I now have 218 biographies in a common format, and am up to #297 in my Ahnentafel. ** For Surname Saturday, I focus on one ancestral family line. Again, this is "cousin bait" of sorts, but it often shows me that I need to do more research on the line. I try to offer published reference information to help researchers find records for the family line if they are interested. At present, I've worked my way down to the 9th great-grandmothers. I have 438 Surname Saturday posts, and am running out of surnames. ** For Saturday Night Genealogy Fun (SNGF), I try to provide a question or challenge for other bloggers and readers to answer with their own blog post or a comment. The questions are about all aspects of genealogy - family stories, Facebook memes, genealogy software, fun things, research questions, etc. There are now 466 SNGF posts. ** For Best of the Genea-Blogs on Sunday, I try to find the most important (in my judgment) genealogy-related blog posts from the previous week for my busy readers and colleagues to check out. I also list other Best Of genealogy blog posts each week because those folks deserve recognition also. There are now 551 Best of the Genea-Blogs posts. 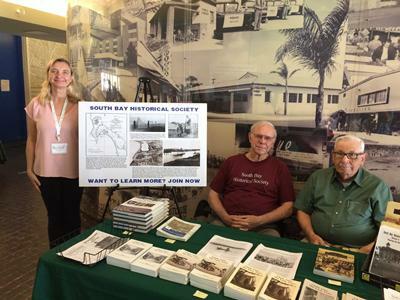 ** Then there are the occasional Dear Randy posts answering questions from readers and society colleagues, the nearly weekly "Seavers in the News" posts, the twice weekly Genealogy News Bytes posts, the weekly Ancestry, FamilySearch and Findmypast online database posts, and more! 3) I try to be a good example as a researcher. Displaying different record types, crafting source citations, analyzing information, and writing about it may help other researchers do similar tasks. Of course, some of it may be a bad example to others - poorly crafted source citations, missing critical details, etc. 4) It's blog fodder. I can always count on the daily themes like these to help me overcome blogger's writer block. 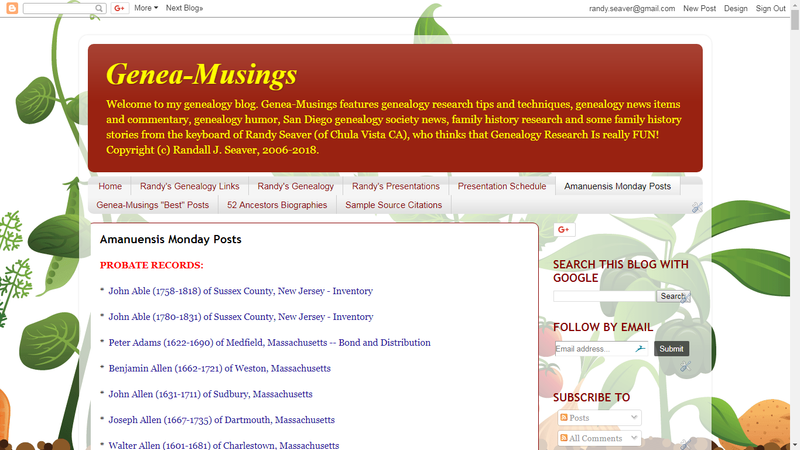 I believe that a genealogy blog should be written daily in order to maintain reader interest. 5) It's my blog - I can write what I want to and when I want to. 6) Doing these posts each week really focuses me on my research - it "advances the ball" toward the goal of a complete and well-sourced database on my ancestral families. The playing field is very long...I don't see the finish line! 7) What other questions do my readers and society colleagues have for me to answer? I like doing them because they are different from the daily theme posts and touch on "why" and "how" rather than my own family research. Email me, or comment on this post, with questions.